Koum’s mobile messaging app now has more than 200 million active monthly users around the world — a larger audience than Twitter’s last public number. But WhatsApp has largely resisted the public eye, ignoring most press requests and conference invites, and operating with a relatively tiny team of 40 people out of an unmarked office in Mountain View, Calif.
That’s not to say there aren’t questions about WhatsApp’s long-term viability. Can it make enough money to survive? Will carriers try to destroy it? Since its service is so simple, won’t fickle users switch to the oh-so-many free alternatives? Why hasn’t it expanded beyond basic messaging to become a platform? So we were very interested to have Koum join us last month at D: Dive Into Mobile to answer those questions and explain a bit about how WhatsApp got to where it is today. 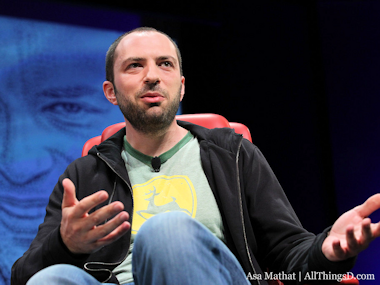 In a half-hour onstage interview, Koum addressed his antipathy toward advertising, his disinterest in selling WhatsApp to an acquirer and his dislike of people publishing rumors about that possibility, the business of selling 99-cent apps, WhatsApp’s relationships with carriers, the strategy of building native apps and many more topics. We’re republishing the full video below. For instance, Koum said, after 10 years working at Yahoo, he developed a deep distrust of how ads corrupt the relationship between a company and its users. “The user experience would always lose, because you always had to provide a service to the advertiser.” That’s even more acute on mobile. “Cellphones are so personal and private to you that putting an advertisement there is not a good experience,” he said.